Searching For A Dentist Near 77056? Under the leadership of Dr. Ali Daneshmand, our trained and courteous dental staff ensure quality general dentistry, cosmetic dentistry, endodontics, oral and maxillofacial surgery, and orthodontic services. If you Google the phrase “dentist near 77056,” the first organic search result you’ll find is Galleria Dental. Houston residents living in the 77056 zip code and surrounding areas depend on our Richmond Avenue office for a wide range of dental procedures. Under the leadership of Dr. Ali Daneshmand, our trained and courteous dental staff ensure quality general dentistry, cosmetic dentistry, endodontics, oral and maxillofacial surgery, and orthodontic services. The Galleria Dental team is committed to providing a comfortable, speedy and pain-free experience that encourages repeat visits from our loyal patients. The doctors at Galleria Dental have decades of combined experience in the field of dentistry, thereby making them supremely qualified to care for you and your family. The office for Galleria Dental is conveniently located for patients throughout the greater Houston area, particularly for residents of Southwest Houston and West Houston. Galleria Dental is striving to make a positive impact on the Houston community through our charitable contributions to the Hurricane Harvey Relief Fund. Galleria Dental takes pride in its dedicated and hardworking staff of dentists near 77056 who deliver safe, effective and affordable dental care during weekday hours. In addition, we strive to keep the lines of communication open between ourselves and our patients whenever possible. Our dental care team can be reached by phone or by email should you have any questions or concerns about such matters as specific dental procedures or insurance coverage. 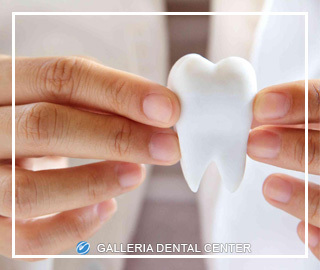 In our view, all the latest dental technologies we have at our disposal are meaningless without the personal touch, which is why the needs of the patient always come first at Galleria Dental. In short, first-time patients seeking a dentist near 77056 are encouraged to give Galleria Dental a try. Please visit our site to schedule an appointment for the specific date that works best for you. We look forward to hearing from you soon!